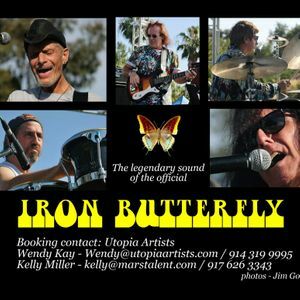 Michael Green - percussion vocals/ , Dave Meros - bass guitar, vocals/ , Eric Barnett - lead guitar, vocals/ , Martin Gerschwitz - keys, vocals/ , Ray Weston - Drums/ , Ron Bushy - is a founding member of the group and the cornerstone of Iron Butterfly! Ron remains a permanent, current and lifelong member of the group! Ron is currently on medical leave and will return when able. In the meantime Iron Butterfly and thousands of fans worldwide send him well wishes! See the official Iron Butterfly on their 2019 Soul Experience Tour. The sound that defined a generation.